I was recently turned onto a different type of cable for a different type of application. Yesterday I talked about the Kenu 2 in 1 and it’s virtues, but one thing it gives up in being lightweight is rigidity. That brings us to the Fuse Chicken BOBINE . 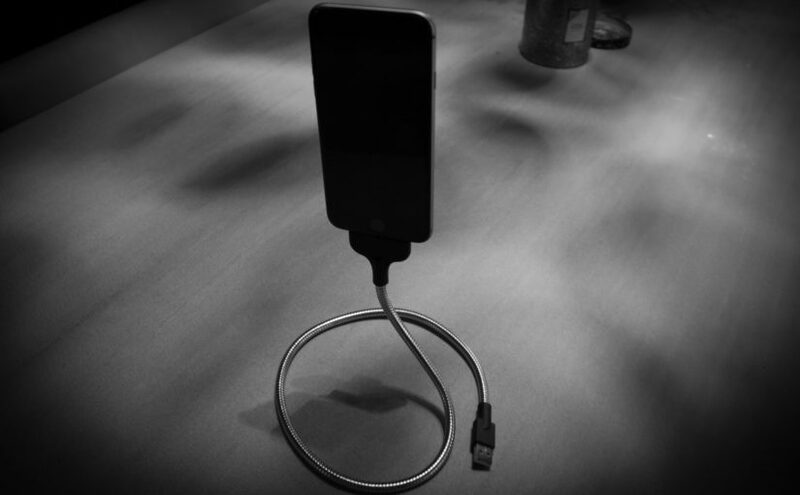 The BOBINE is basically a flexible semi-rigid USB to lightning cable that allows you to work on your phone in a semi-upright position. For the most part I don’t think there’s a lot of value in this, except when you’re traveling. Just as a test, I laid down on the ground and used the BOBINE to semi-connect it to my backpack. I’ve had to use my backpack as a back/headrest in airports on extremely long layovers when there is no open Admiral’s club in sight. I’m not proud of it, but sometimes a business traveler has to do what they have to do – even in a suit. And sometimes that’s laying on the ground with food poisoning and yes, that’s happened to me. The nice part about the BOBINE is that you don’t have to use your arms to keep it in place and in view while you’re in strange positions – like on your back feeling like you stomach is on strike from the rest of your body. When you have your hands free you can use a bluetooth keyboard easier and get more work done, or you can simply watch videos and try to distract yourself from that feeling in your stomach. Anyway, I think there are far less uses for this than other cable management systems because it requires me to remove my case to fit properly, but still an interesting one to have with you on International flights where you might end up having to deal with some extremely odd layovers. A little comfort can go a long ways. And in case you were wondering, it was the oysters that did me in. Of course it was, I can hear you saying. One of the problems I’ve regularly run into as a Smartphone Exec is that I regularly have the wrong cable for the occasion. I either have a microUSB cable or a lightning cable, but often the wrong one at the most inopportune times. On a flight I ran across an advertisement for Kenu Tripline (pronounced “Canoe”) that offers a pleasantly simple solution. The nice part about it is that it has both cables in one. 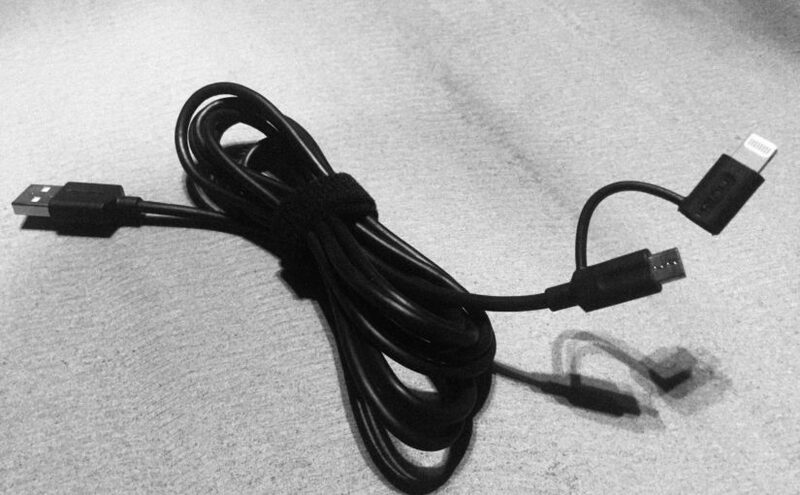 If I happen to need one to charge my headphones, I have that, if I need the other to charge my phone, I have that. All in a lightweight package. I also happen to like that they have 3′ and 6′ options. Often times I make the mistake of thinking shorter is better, but keep in mind how often you are using shared plugs in conference rooms and having an extra foot or two of distance is a life-saver. That’s even more critical when you’re using your mobile phone during a presentation. Often times the plugs are on the floor and 3′ is barely long enough at the best of times. 6′ is just much more comfortable and I find it’s worth the added ounces. And it’s still less weight than two cables that get caught up with one another and misplaced. Reduce and simplify. That’s the mantra, right?